Easy to grow, one of the classic 'fine herbs'. 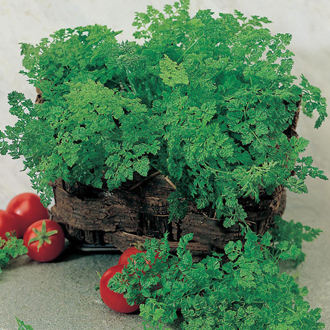 Delicate flavour, known as 'gourmet' parsley. Outdoors: sow thinly, March-July, where they are to crop, 0.5cm (¼") deep, directly into finely-prepared, well-drained soil, which has already been watered. Seedlings usually appear in 14-21 days. Thin seedlings to 20cm (8") apart. Water well until plants are established. For a continuous supply, make sowings at two to three week intervals. Or to grow indoors all year round, sow thinly 0.5cm (¼") deep, in small pots of compost. Water well and place in a warm position. A temperature of 15-20°C (60-68°F) is ideal. Plants can be grown on a light windowsill. Harvest: Indoor crops all year round, outdoor crops from May. Pick a few leaves, as required, from each plant so that they regrow quickly. They may be dried or frozen, but for best flavour, use fresh. The distinctive flavour is particularly delicious in egg dishes and makes an excellent herb butter for fish, potatoes, or asparagus.